Every week, Making A Mark gives an insanely talented artist a little brag-space right here on IADW. This week, it's the turn of Greek computer artist Isidore Koliavras. A man whose talent for moving traditionally 2D heroes up a level, beats anything I have ever seen try to do the same. While some of his works are collaborative efforts, the results are always fantastic. The Maid of Might above was designed for a fan who wanted to give 'movie Supergirl' Helen Slater something to autograph next time she was in the UK! I don't know about you, but the end result is so powerful, I don't know if I could even let Helen scribble all over it! Crediting his love of comics to Spidey, Isodore once again pulls out his trusty Photoshop CS5 and Poser Pro 2010 to do his inspiration justice. Also a bat-fan, Neil Gaiman and Andy Kubert's Whatever happened to the Caped Crusader? tops his Bat-stories list. Can you say "I got yer' Aquaman Movie poster right here"? 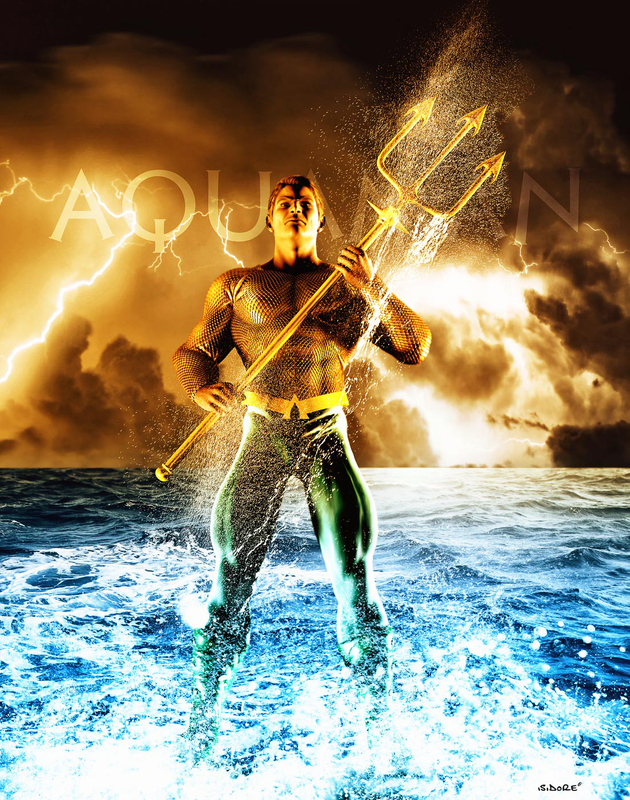 Look at the detail in that shot - the infamous orange shirt, the water, hell even Aquaman's face! I struggle to make even a sphere in 3D! Luckily for you, you don't even have to book a ticket to Greece to buy him a congratulatory beer. Simply pop over to his personal website and shake his hand by dropping him a few nice words, and checking out more of his work (Jump). 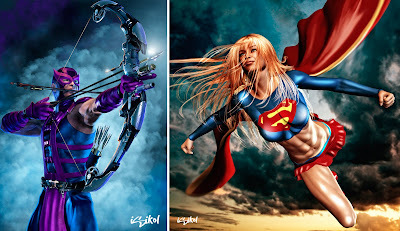 those are great rendering of Hawkeye and Supergirl. get a load of her six pack! plus i've been wanting to see more of Hawkeye since THOR. "should i take him out or do you wanna keep sending more guys to get beat up", great line. Ha - yeah I liked that line too Dave - why he wasn't in the Destroyer ravages town scene I'm still scratching my head on, non-comic fan audiences could've easily flipped him off as a non-key character after Thor, which is almost sacrilege. Glad you liked Isadore's work!